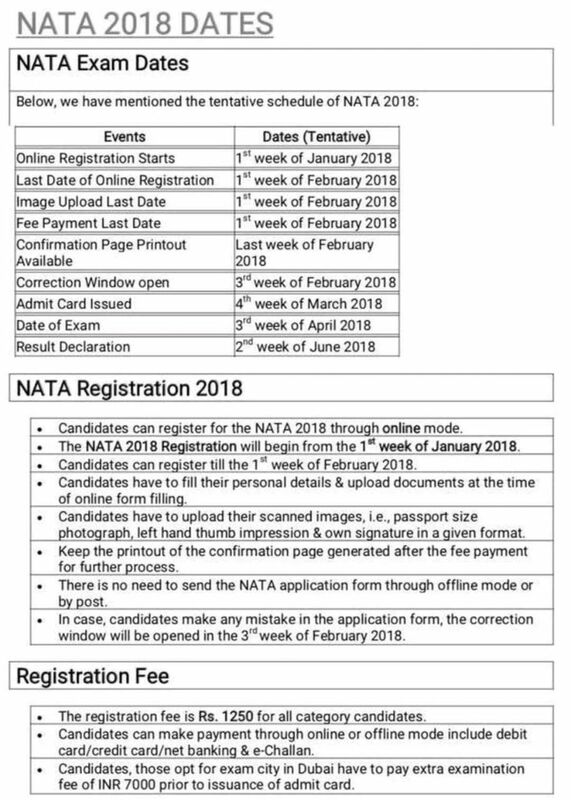 National Aptitude Test in Architecture Online Registration for NATA 2018 has started.Detail schedule for exam registration.Also please visit www.nata.nic.in. SPPU's FY B.Arch Sem I & Sem II theory exams for regular and backlog starts from 26th December 2017. For detail time table. Commencement of Second Year B.Arch study tour to VARANASI – BODHGAYA From 23rd Nov 2017 to 3rd Dec 2017. Commencement of Third Year B.Arch study tour to COCHIN – ALLEPPEY From 24th Nov 2017 to 2nd Dec 2017. Commencement of Fourth Year B.Arch study tour to AMRITSAR –CHANDIGARH- SHIMLA- DELHI- AGRA- FATEHPUR SIKRI From 30th Nov 2017 to 12th Dec 2017. Next Academic Session of 2017-18 for S.Y and T.Y. 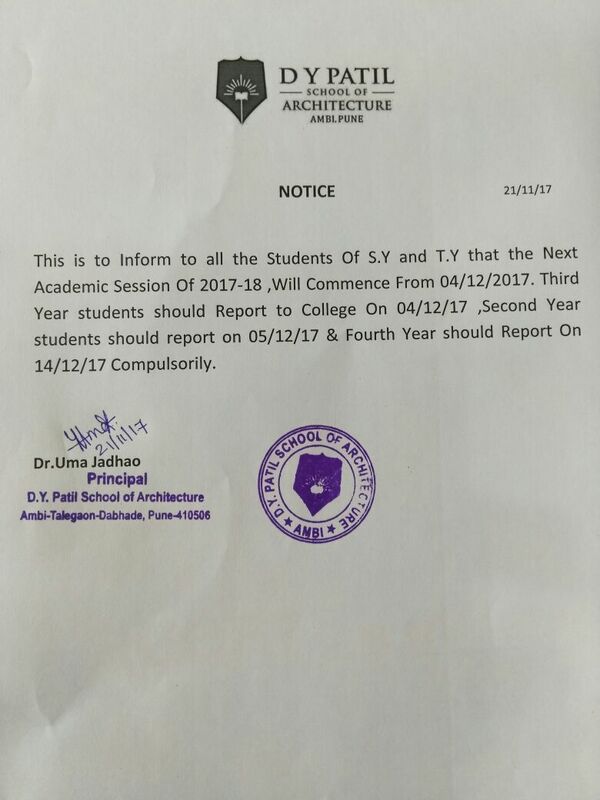 B.Arch will commence from 4Dec 2017. ◆Event Venue : Dr. D. Y. Patil stadium, Nerul. ◆Theory papers will be conducted from 28/10/2017 to 02/11/2017. ◆Sessional assessment and viva-voce will be conducted between 25/09/2017 to 07/10/2017. 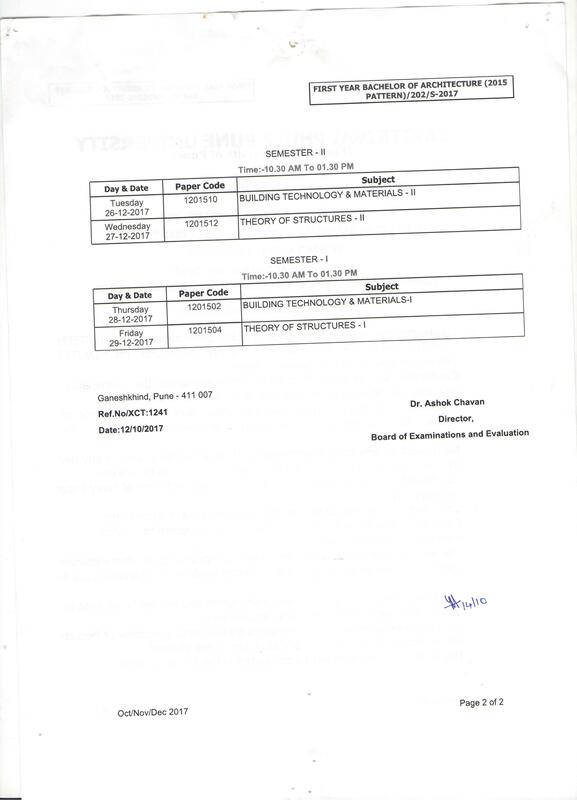 End sem examination date declare for Second Year B.Arch and Third Year B.Arch – Semester III,IV,V,VI ( 2015 pattern). ◆Theory papers will be conducted from 23/10/2017 to 25/10/2017 , 26/10/2017 to 28/10/2017 . First year orientation programme is scheduled from 9th August 2017 to 15th August 2017 with hosting of different events. Combination of Co-curricular and extra – curricular activities which consists of workshops, competitions, lectures, etc. for all round development like team building, team spirit, co-ordination between seniors-juniors, skill development, fun etc. Third year students will be visiting P.L.Deshpande garden to experience the landscape designed and understand different elements related to it. On occasion of International Yoga day, DYPSOA celebrated the spirit by practicing different “Yogasanas” under the guidance of yoga guru Mr. Ratnakar Jadhav. Around 300 participants along with all the staff from other institutions in DYPTC also participated with full enthusiasm. 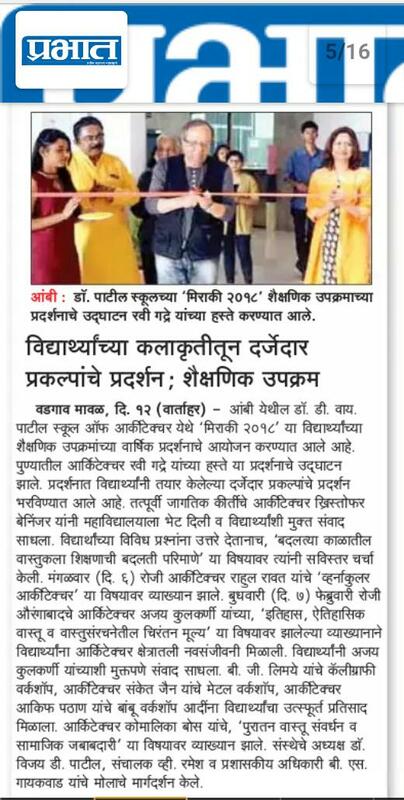 Beginning of New Academic Year 2017-2018 with ‘Festival Of Architecture’ lecture series from 7th , 8th, 9th and 13thJune 2017. New academic year has begun at DYPSOA with Festival of Architecture lecture series by prominent architects in the field like Ar. Sergio Porta, Ar. ShabbirUnwala, Ar. NaredraDengle, Ar. Deepak Guggari enlightening and guiding students them to different approaches on could think towards architecture.